Or: what a concert has in common with a pneumatic hammer . Especially dangerous is the so called “leisure noise”. In this case we perceive the sound level mostly as comfortable although it reaches incredible dimensions. Hearing damages caused by noise are vicious. 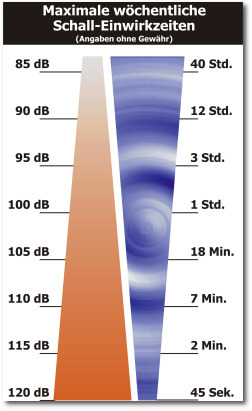 Because hearing loss caused by noise influence is only rarely perceived indirectly. Noise damages the hearing slowly and unrecognized but steady and most of all lasting and irrevocable. The sensitive hair sense cells in the human’s inner ear are pulled out due to constant noise influence. A good example for when it is too loud for the human hearing is the working world – independent from subjective perception. From a middle constant level of 90 dB (e.g. a milling machine) wearing a hearing protection is regulation. 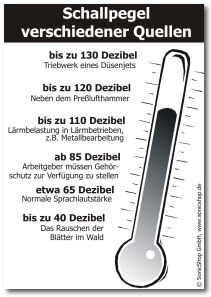 Just compare: Average values of 90-105 dB are reached on a dance floor in discotheques, 80-100 dB during an opera performance in the orchestra ditch and 100-115 dB during rock concerts. In techno discos even the pain threshold - which is around 120 dB – is crossed! With a sound level meter you can check how high the level is around you in different situations. Visit our sound level site where we compared different volume levels. 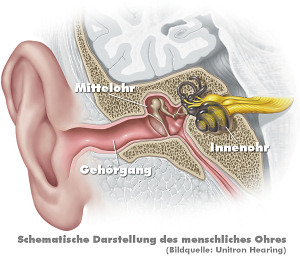 If the noise you are facing is not explicitly higher than the pain threshold, nobody can say for sure when a hearing damage will develop (ear noises like whistling, rustling and so on point to a secure damage). Depending on the noise’s duration and frequency the hearing can cope with the above mentioned noise level once in a while. On the other hand it can already be damaged with lower values. But it is a fact that it is just too much for your hearing if you are constantly exposed to noisy, continuous or simply disturbing sound. And if the right combination of sound level (dB), frequency (Hertz) and time of influence adds to this then your hearing and your health can even be ruined. SonicShop is the first step into the right direction. With hearing protection you can diminish the noise level and maximize the sound.